History and tradition apart, the sculptural wealth of the Madurai Meenakshi Sundareswarar temple complex - in itself constitutes a breathtaking art gallery. In front of Sundareswarars shrine is the Kambattadi Mandapam known for its life sized sculptures. In the center of this hall is an eight pillared mandapam, with images of the various aspects of Shiva. The Nandi Mandapam in this hall is a monolithic structure. Also seen in this mandapam are life sized images of Agora Veerabhadra, Agni Veerabhadra, Kaali, the Urdhwa Taandavam of Shiva, Ardhanaareeswarar and Sankaranarayanan. Other images deserving special mention here are the sculptural portrayal of Meenakshi Kalyanam, images of Tripurasamhaaramurthy, Kaalasamhaaramurthy and Raavanaanugrahamurthy (see also the Elephanta caves of the 1st millennium CE). Within the southern prakaram of the Meenakshi shrine are seen sculptures of the King Tirumalai Nayak and his family  known for their contributions to the temple. 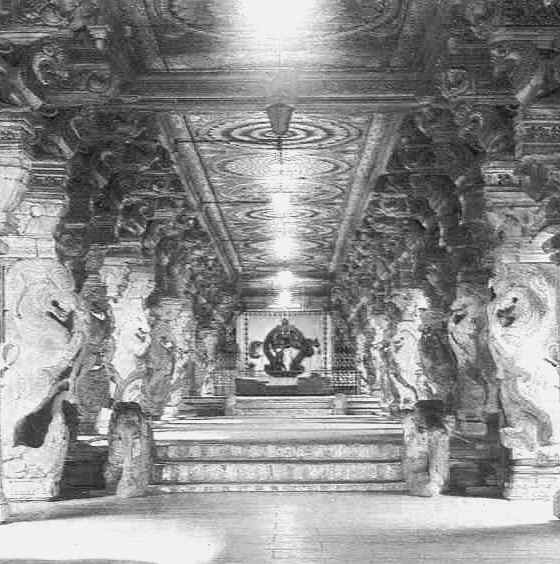 The 1000 pillared hall is accessed through the 100 pillared hall from the Kambattadi Mandapam. The 1000 pillared hall is considered to be a museum in itself. The grandeur of sculpture and the profusion of stucco work here by far surpasses any other structure elsewhere in the world.